Here is what we saw. I have indicated in red the position where the ice serac fell away (for a more detail analysis of the position, see the photographs provided by my team mate, Mel Huang). We were very lucky. Had we set off two hours earlier we may well have been swept away. Others weren’t so lucky. 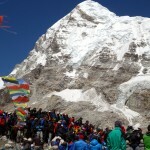 There were as many as 100 people in the Khumbu Icefall that morning. How many were trapped by the avalanche we didn’t know, but it soon became clear that a major tragedy was unfolding before our eyes. In fact the catastrophe could hardly have happened at a worse time, or in a worse location. A ladder had fallen out of position at a steep section of the route through the Icefall, causing a bottleneck. At that moment 40 or 50 Sherpas were standing above the ladder in the path of the avalanche, waiting to come down. Many were killed instantly, not by being buried, but from shards of shattered ice exploding like shrapnel. Injuries were horrific, and many survivors and rescuers were traumatised by what they saw. 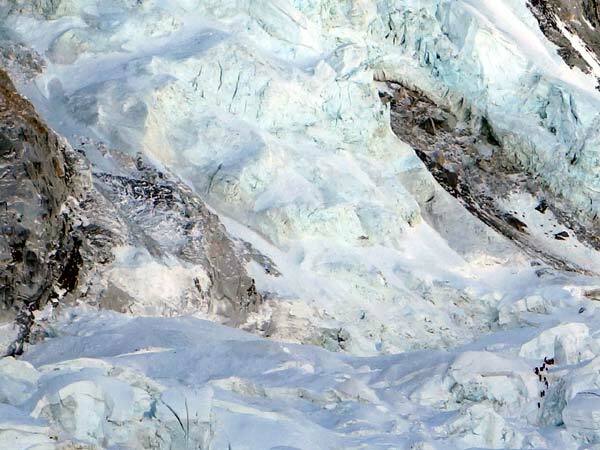 Shortly after the avalanche occurred we arrived at the foot of the Khumbu Icefall and peered up into the ice through the lenses of our cameras. We were relieved to see many little figures – survivors – still up there on the ice. We did not know then how many had been killed, but radios were crackling, and over the next few hours the true picture began to emerge. Somewhere near the skyline we could see figures trapped above the fallen ladder and gingerly edging their way down. 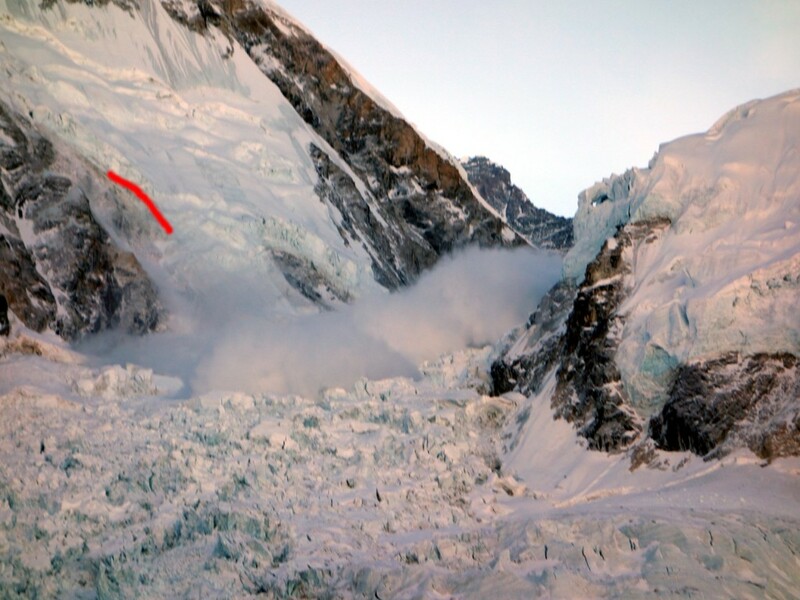 They were very close to the West Shoulder where the serac had fallen, as this picture shows (bottom right). 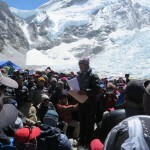 Those who were already acclimatised to the altitude, including Sherpas and western guides, headed up to the avalanche site. Some took ladders to restore the route, and others took spades to help retrieve the fallen. 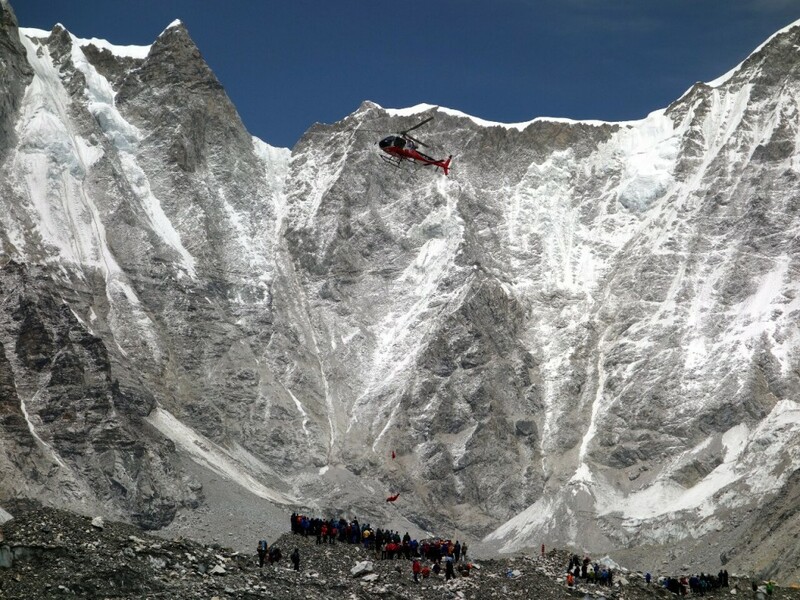 At around 10am helicopters began arriving to bring down the dead and injured to Base Camp, where an emergency room had been set up at the Himalayan Rescue Association’s Everest Base Camp Medical Clinic. Crowds gathered at the helipads and watched in disbelief as one by one the deceased were brought down on long lines. The helicopters returned again and again, and we lost count of the number of journeys they made. In all 16 people died that day. It could have been anybody – a team of western clients from International Mountain Guides (IMG) were climbing through the Icefall at the time and just 15 minutes away from the tragedy – but it so happened that all of the dead came from Nepal. While not all teams lost members, all of us had those who were friends or family of the dead. 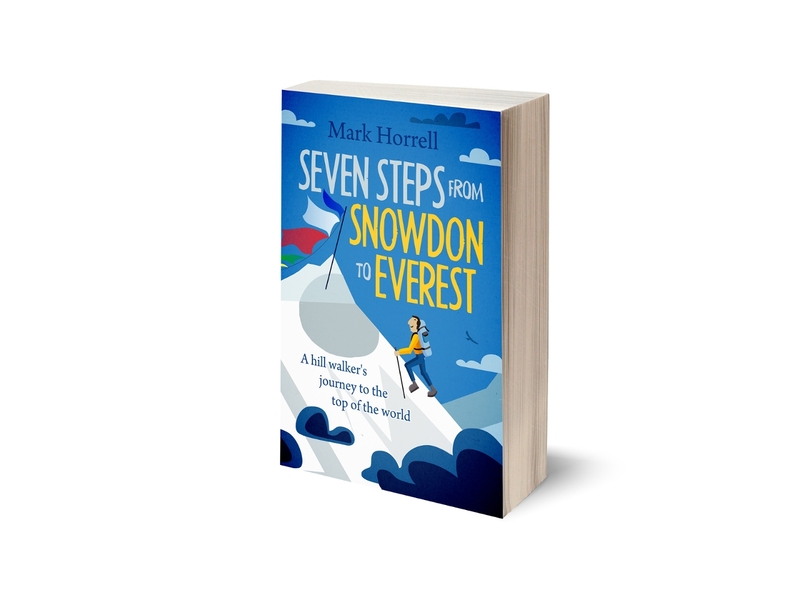 It was the worst single tragedy in the history of mountaineering on Everest. Two days after the tragedy the Government of Nepal announced they would provide 40,000 Nepalese rupees (around $400 USD) to each of the families of the deceased. This triggered a labour dispute which a week later led to the mountain being closed for climbing. 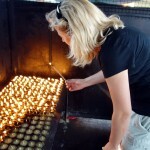 Luckily the Government of Nepal was not the families’ only means of support. In the immediate aftermath of the tragedy many appeals and trust funds were set up to raise money for those who had lost family members. For example, the Chinese climbers Quingyong Zhang and Geng Zhu, part of the Everest Chinese Dream Expedition team who lost Sherpas in the avalanche, pledged 7 million Nepalese rupees (around $70,000) to the families of the victims. A fund set up by the American Alpine Club had raised $50,000 before the end of April. 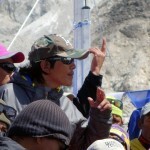 The Japanese climber Ken Noguchi announced he would be making a donation of 10 million yen (about $97,000). A GoFundMe page for the families of three Sherpas employed by Himalayan Guides aims to raise $50,000 and is well on the way. Sir Edmund Hillary’s Himalayan Trust has so far raised another 29,000 New Zealand dollars (around $25,000 USD). National Geographic photographer Aaron Huey raised an astonishing $424,000 by selling prints over the course of 8 days. A list of other organisations accepting donations can be found on Alan Arnette’s website (under General News & Notes). It is hoped these funds will be managed responsibly, so that the money finds its way to those who need and deserve it. Viewed through the lens of time his words sound quaint and patronising, but the sentiment is genuine. Since that morning in April many people have blamed western climbers for a disaster which owed an enormous amount to terrible luck. There is an element of danger in mountaineering, as there is in sailing a yacht, driving a car, or crossing a road. Sometimes you just have to hope it doesn’t happen to you; this time we came within such a whisker that all of us were scarred by it. While the wound will never fully heal, the goodwill and generosity of those who love the country of Nepal has ensured the families of the dead will not be forgotten. Sincere condolences to all those who perished in this avalanche.Every profession , sport or vocation has its darker sides including mountaineering.As a former seafarer and now adventurer i understand the perils of doing or trying to accomplish the unthinkable which is what adventure is all about.I myself have led a charmed life escaping death on numerous occasions. At times we humans pay a high price for our adventures.Hope the deceased Sherpa families are suitably compensated. I compared one pic taken before the avalanche with another one taken after the avalanche, found the location of that serac fell away is a little higher then that you marked. I have marked it on a pic, how to sent it to you? Thanks for sending the before and after photos, Mel. They’re great, and I felt they deserved a separate post. I love your self deprecating humor about no one reading your blog but you are so wrong. I absolutely loved your post and read them often. Please continue to post your adventures and I will keep reading…. I have been working on a documentary about Everest and I have come across some footage that you shot. Would you be able to let me know if I can license it for broadcast use? It’s very unlikely. I am always being asked for this footage, and I nearly always say no.